This week in my Strategies for Nutrition Education class, we spent a little time discussing Self Determination Theory. It’s a behavioral theory that posits three essential conditions of a person’s motivation, engagement, persistence, and creativity: autonomy, competence, and relatedness. Autonomy refers to feelings of freedom and self-governance, competence to feelings of mastery, and relatedness to feeling connected and engaged with others. The more these conditions are evoked, the theory goes, the better the chances an individual will have of successfully implementing and maintaining behavior change. For the purposes of the class, we were studying the theory in the context of health behaviors, like eating more fruits and vegetables, exercising, or reducing soda consumption. As we began to explore interventions that have used SDT as a theoretical framework, I was surprised to see how often relatedness was indicated as a major precondition of successful behavioral change. I guess I’d assumed that competence—feeling in command of certain skills or knowledge—might be more consequential. But what the studies we examined suggest is that it’s incredibly difficult for people to change or maintain health and diet-related behaviors without strong social support. The more I thought about it, the more this finding aligned with what I’ve observed among those who are trying to transition to a plant-based diet, which is that support and reinforcement play a critical role in sustaining the lifestyle over time. Such support doesn’t always come from friends or family—sometimes it resides in the online community, in local organizations, or in activist gatherings and activities. No matter where it comes from, though, it helps to make people feel connected, and it inspires a sense of belonging that eases the admittedly difficult work of changing dietary habits. 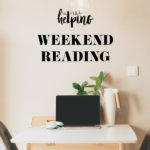 Some time ago, a reader commented with the question of whether or not isolation or a sense of disconnection might play a role in cases of those who fail to thrive or feel well as vegans. I didn’t have an answer then, and I still don’t: every person’s story is unique. But I suspect that feelings of social isolation, rift with tradition, and/or lack of familial support can injure a person’s experience of being vegan or vegetarian, if only because they create considerable stress. All the more reason for vegans to continue building a supportive, welcoming, enthusiastic, and inclusive community, both “IRL” and virtually. These thoughts were running through my mind as I read this article, a powerful piece of reporting on the impact that culture has on the experience of mental illnesses such as schizophrenia. The article is long, complex, and focalized on the story of psychologist Nev Jones, who has herself received a schizophrenia diagnosis. One of the points the article makes is that people who experience schizophrenia in cultures that are less likely to stigmatize or isolate people with mental illness tend to fare better; in many ways, they’re worse off in Western culture, where mental illness can be medicalized and problematized in a way that is profoundly alienating for those who have been diagnosed. The article touches on the idea of “abjection,” or the marginalization of people by labeling. The insights brought me back to reading Lonely City, a book that addresses the ways in which lonely or isolated people are often pushed deeper into their alienation by societies that fail to embrace and accomodate difference. And it made me think about the ways in which our treatment of mental illness might profoundly undermine the sense of relatedness that seems to be—at least according to some theories—so essential to our well-being. Self determination theory is just one lens, but it resonates with me; I know that my sense of self suffers greatly when I feel dispossessed of autonomy, competence, or relatedness. In the last six months I’ve tried particularly to evoke my relatedness more strongly, and it has helped me to grow and heal. Now I’m thinking about ways that I can bring more awareness of relatedness and its importance to my work; I’m more conscious of the need to ask my clients about their social supports, interpersonal resources, and sense of belonging when I’m talking to them about dietary change. And I feel encouraged in my efforts to keep writing about mental health, not only because it helps me, but also because it’s my own, small contribution to the goal of tearing down stigma. 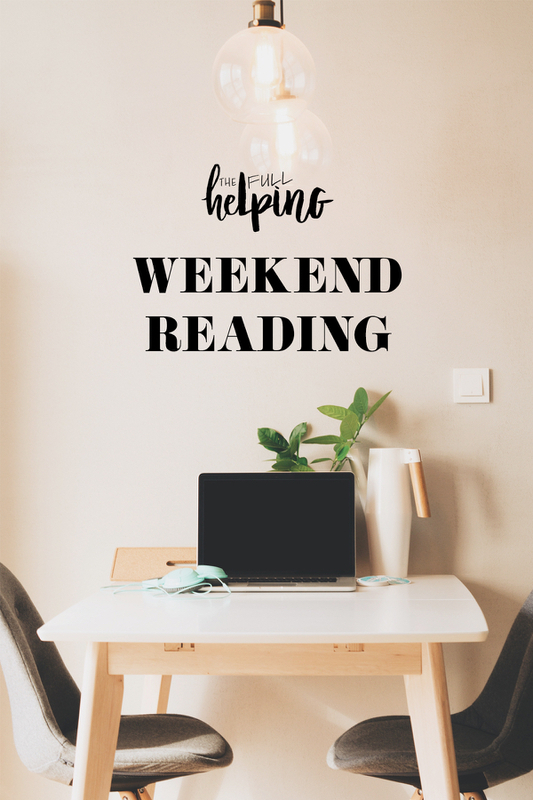 Enjoy the reads this week, and of course, I hope you enjoy these tasty recipe finds from around the web! 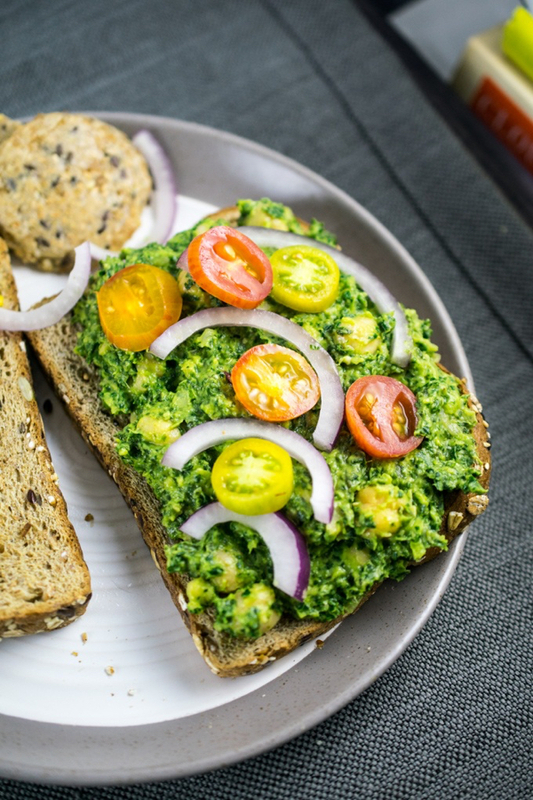 Hooray for yet another awesome, packable lunch idea: Shannon’s collard greens pesto chickpea salad. It’s a simple recipe, but I’d really never have thought to smash these ingredients together, and I’m so intrigued. Always looking for new ways to use collards. 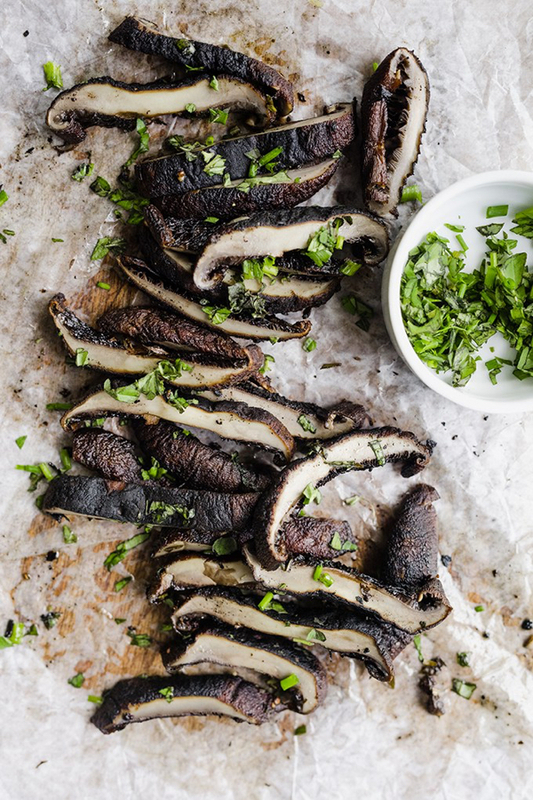 These grilled portabello mushrooms are so versatile: you could stuff them into a sandwich or wrap, use them to top grains or polenta or grits, throw them on a salad, or serve them with pasta. A great way to fold umami into vegan meals. 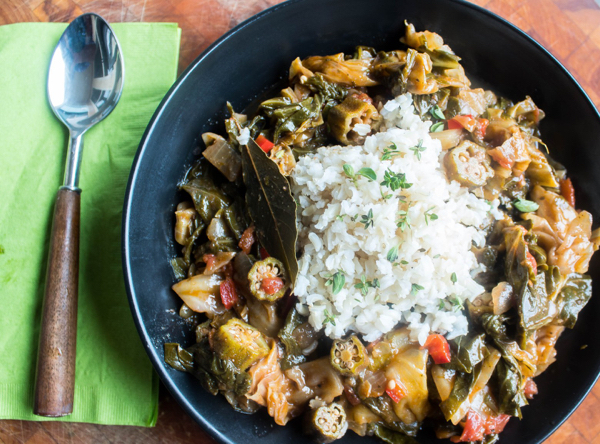 I’ve never tried a homemade vegan gumbo before, but I’d really like to. When I do, this vibrant recipe will be my inspiration. 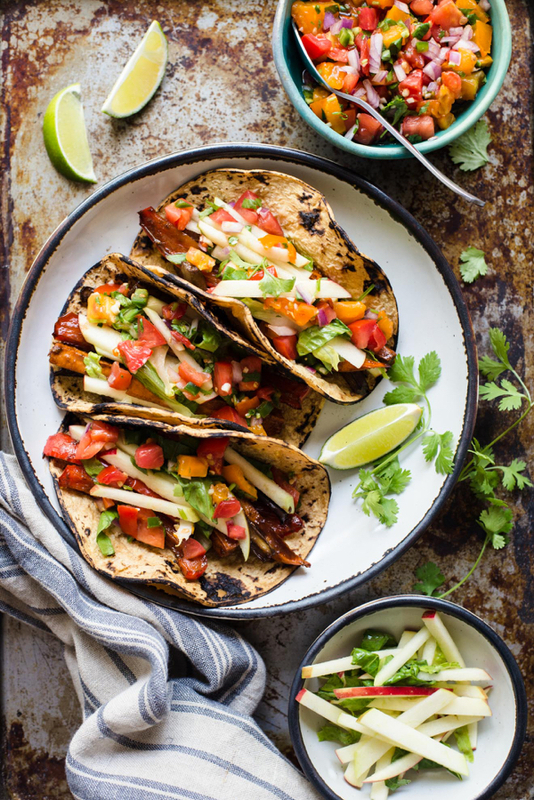 Tamarind paste is one of my favorite, flavor-packed ingredients to work with (most recently this stuffed eggplant recipe), and I’m loving Lisa’s healthy, colorful tamarind glazed vegetable tacos. 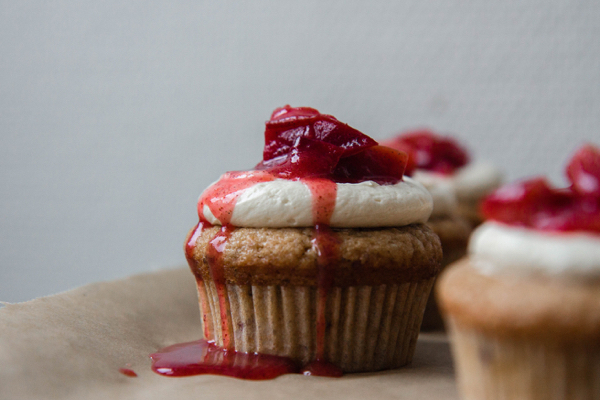 Plums are still in the farmers markets in New York right now, and before they dissapear I can’t wait to make these plum muscovado cupcakes with spiced compote. Just beautiful. 1. First, insights into the connection between culture and mental illness/health. 2. This article touches on the same topic, but with a particular focus on how Chinese people experience depression. The article touches on research suggesting that Chinese people demonstrate a greater tendency toward somatization—that is, the expression of feelings and/or psychological distress through their bodies—than do Westerners. It’s interesting to me because I find that my depression manifests more and more physically as I get older, and I’d imagine that the research has important implications for cultural literacy in mental health screenings and treatment. 3. Really interesting reporting on new developments in IVF and fertility treatment, which are calling into question previous standards about what makes an egg viable. 4. A roundup of awesome, cutting edge innovations that are bringing “smart” technology to biosensors and more. 5. There’s plenty of evidence in favor of the value of eating breakfast, and in my work I emphasize a balanced, fulsome morning meal as an important “anchor” in healthful eating patterns. Now evidence is linking breakfast skipping to increased rates of atherosclerosis—another good reason to whip up something tasty, soulful, and sustaining early in the day. Happy Sunday, friends. I’ve got a killer, perfectly seasonal vegan dessert to share with you this week. And if you haven’t yet, be sure to enter my giveaway to win a copy of Celine Steen’s Bold Flavored Vegan Cooking, which is truly awesome! Incredible post, Gena. I find the social perception of mental illnesses to be a profoundly interesting topic, I am so glad you linked those two excellent articles on the subject. Thank you! HI Gena, What a fascinating frame and theme to Weekend Reading this week–I am familiar with Self-Determination as a concept in Disability Rights–it has helped me tremendously to understand how to make my own decisions about living and getting help and so forth over the years to see it through this lense. I hadn’t heard of it as a general theory connected to getting results in self-change like diet, etc., but that makes a lot of sense. Also the relatedness part, in both disability rights and dietary lifstyle choices-it does make a ton of difference to have a support network that well, supports your right to self-determination. In my case, my son and daughter-in-law joined me early on in my vegan journey, and of course I have a splendid online support community, including The Full Helping. But with friends, not so much in terms of participation. However, they do cheer me on, and that’s what counts. Anyway, so much to think about. I am looking forward to checking out the article about Chinese response to depression and somatization of it. And the food picks are SO inspiring. That collard chickpea pesto!! OMG!! And such a beautiful plum cupcake. Lots of love and thanks to you, my dear!